It was a dream come true to set foot inside the famed Karueein, the oldest continually operating university in the world (Guinness, UNESCO). I will use the English form of the Arabic name, as that is more familiar to me, Al-Qarawiyyin. It was founded in 859 CE, which would be 244 AH (hijri calendar), so 234 years after the death of the blessed beloved Muhammed (peace be upon him). 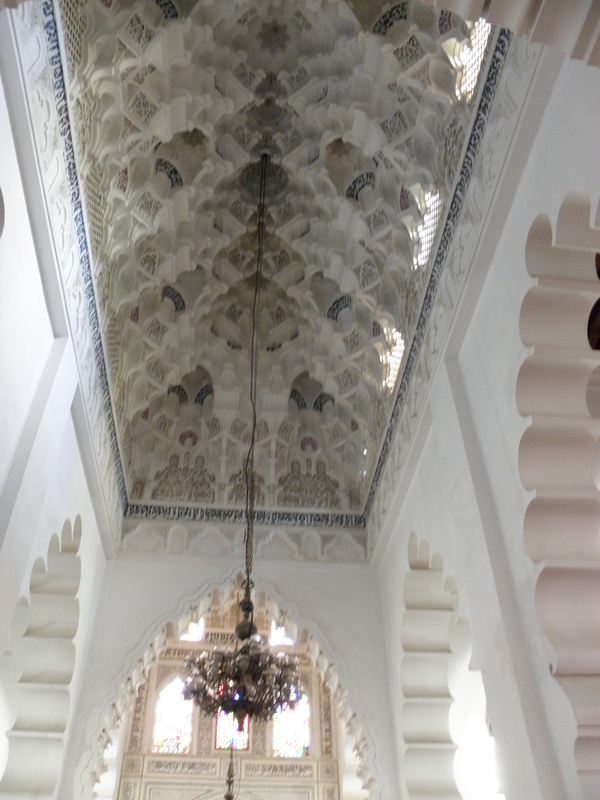 It was built by a woman, Fatima al-Fihri. And what a lady she must have been. She was wealthy and endowed her wealth to build this institution. It is said, such was her piety, that she continuously fasted for the duration of the building of the institution. Indeed, as per a classical Islamic understanding of success…her intention and good deed was surely accepted by God, for it has been rewarded by the benchmark of divine acceptance – longevity! She is given the affectionate title, Al-Fihriyya – Allah be well pleased with her! We entered the mosque of the Qarawiyyin through one of its 14 gates. In the old Muslim world (and indeed to this day, though it remains as only a slight shadow of its glorious past), mosques were a center for learning and community. 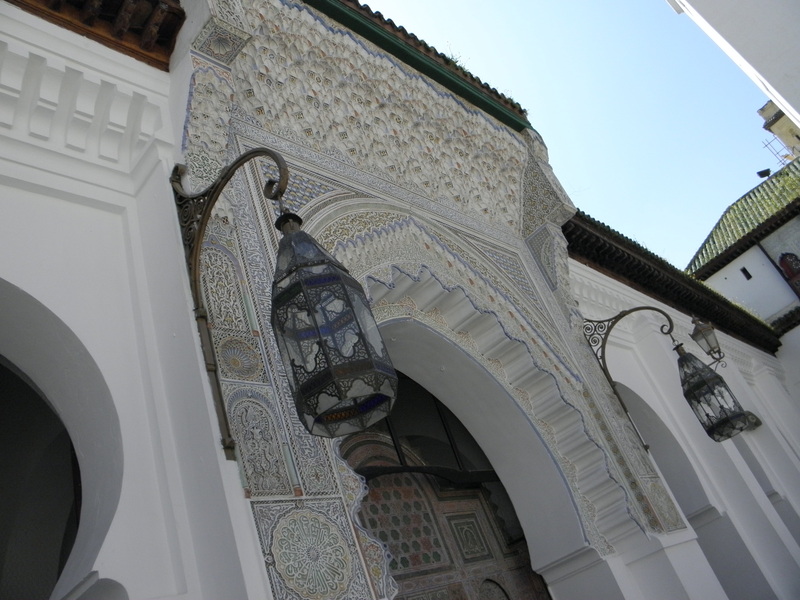 Education was free in the Muslim world, the Sultan supporting the scholars, or more frequently, their work would be supported by rich endowments, called ‘waqf’ in Arabic. 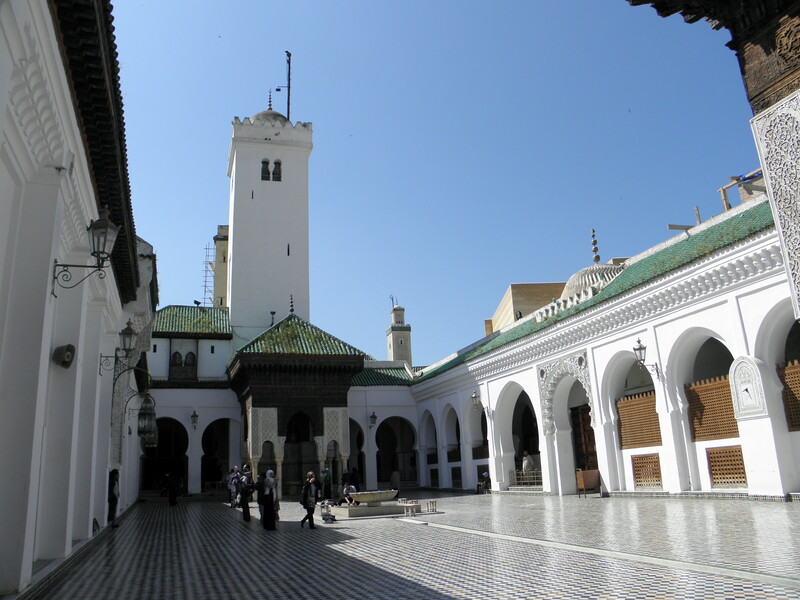 Awqaf (plural of waqf) would be established by wealthy families, so that scholars would be supported and could work independently from state sponsorship – ensuring free thinking. 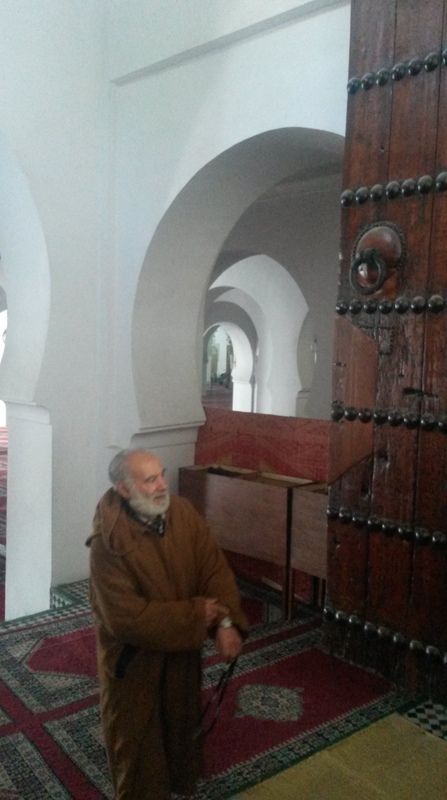 So scholars would stay behind after one of the canonical prayers and stand at a pillar of the mosque (rarely there would be chairs on raised daises – you can still see some in old Turkish mosques) and give a lecture. Anyone who wanted to was free to listen or go. 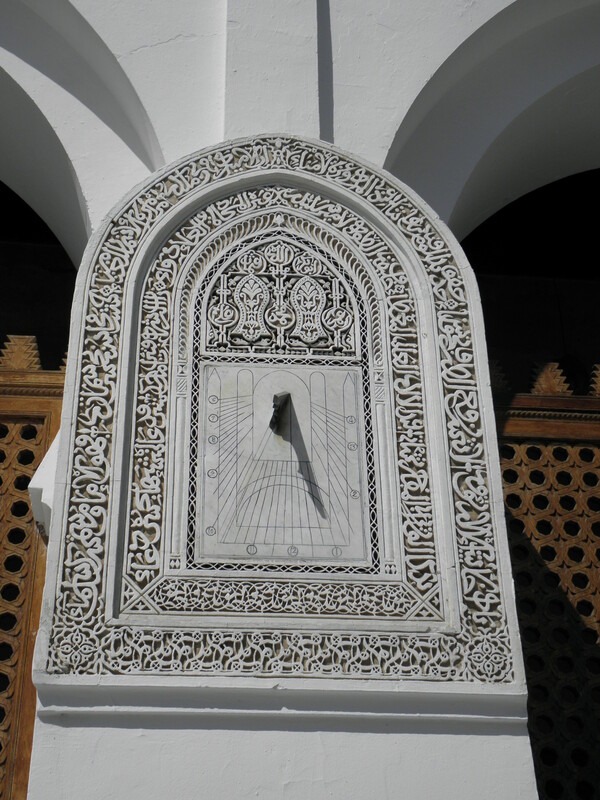 One can imagine serious students keeping a timetable of talks times and scurrying from mosque pillar to mosque pillar! As well as busy merchants, housewives etc. wandering in and out catching a talk here and there as they go about their daily business. So the mosque is an essential part of the University. The university complex grew around it, and included many amazingly beautiful dormitories (another post inshaAllah) and buildings. 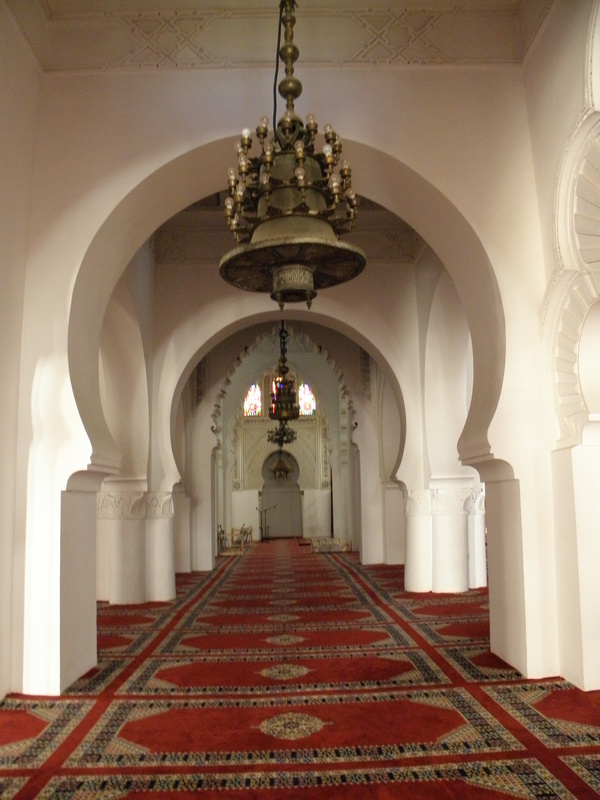 The mosque is not used as a lecture hall anymore, though we were treated to a glimpse of the past…when the imam came by, he sat down on the carpet by a pillar, we sat in a circle around him and he gave us a mini lecture on the history of the Qarawiyyin. Beautiful, simple, and easy – devoid of all the trappings of a modern classroom. The teacher is fully exposed and the student has full access to him. What a teacher one has to be to take this place confidently! Pioneer scholars include Ibn Maymun (Maimonids, (1135-1204) who was taught at Al-Qarawiyyin by Abdul Arab Ibn Muwashah. 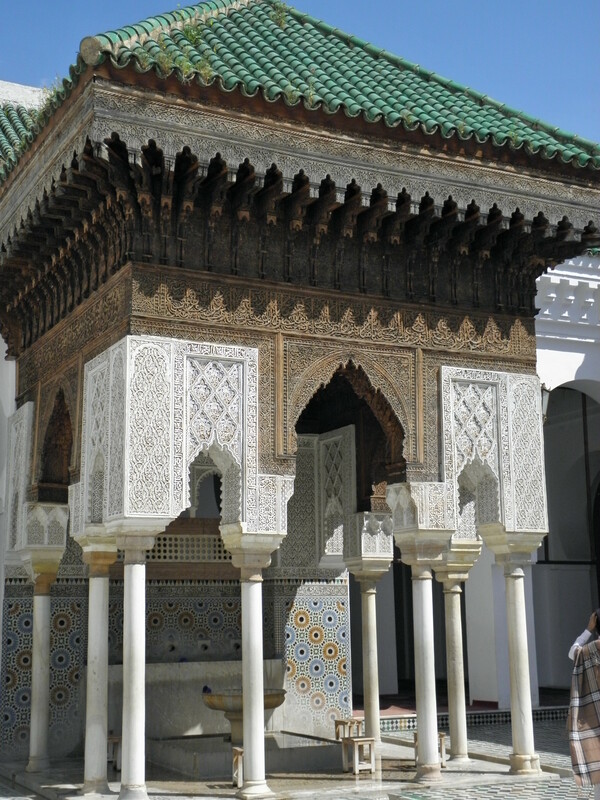 The famous Al-Idrissi (d.1166 CE) is said to have settled in Fes for considerable time suggesting that he must have worked or studied at Al-Qarawiyyin. Sources also list a number of peers such as Ibn Al-‘Arabi (1165-1240 CE), Ibn Khaldun (1332-1395 CE), Ibn Al-Khatib, Alpetragius, Al-Bitruji, Ibn Harazim, and Ibn Wazzan are said to have all taught in Al-Qarawiyyin.Some historic accounts also spoke of Ibn Zuhr (d.1131 CE) spending a great deal of time travelling between Andalusia, Fes, and Marrakech. Ibn Khaldun, for those not familiar, wrote one of the most comprehensive world-histories…it is a masterful compendium of global events and civilizational analyses. Still studied to this day in the Muslim world. I will stop myself going on about the scholarship there (this junior scientist finds it very easy to indulge in long digressions on this topic) and post pictures below. They are mostly of the mosque…where we were privileged to join several congregations and then just ‘hang-out’. 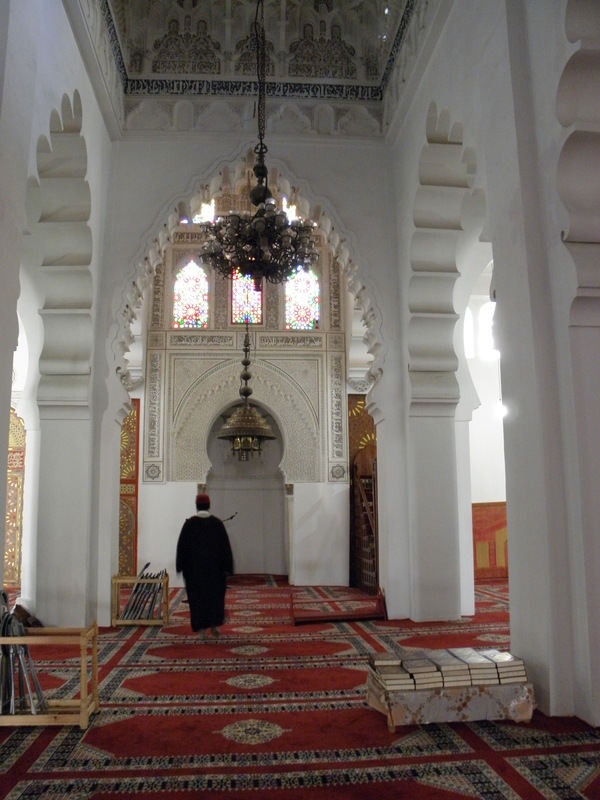 Inside where the mihrab (=prayer niche) is. The mihrab is a distinguishing characteristic of a mosque, it faces to Mecca and is where the Imam stands to recite. The hollow niche acts to echo his voice so the congregation can hear him. 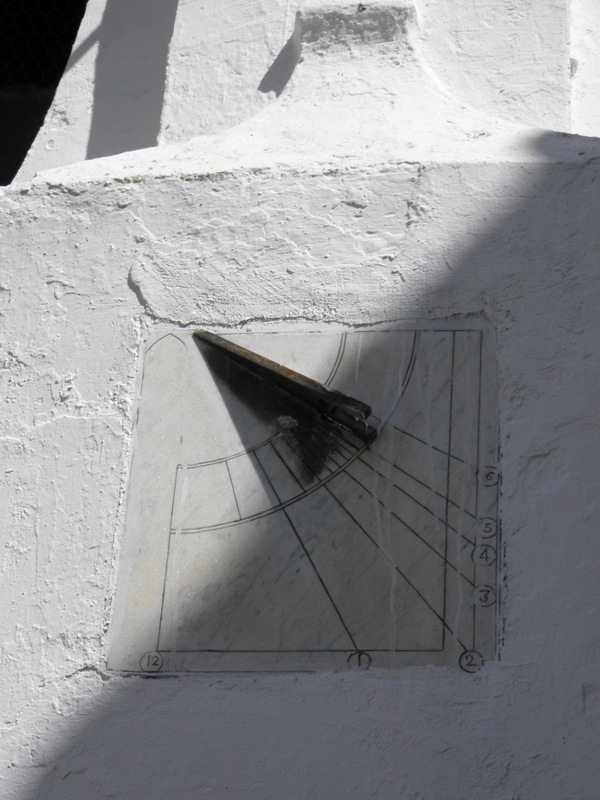 The niche was a few degrees ‘off’ from the direction of Mecca…but to me that only spoke to how old the mosque is and I was amazed they could calculate the direction to so close to accuracy ~1200 years ago! Finally, the doors being opened by the beautifully dignified caretaker…what a feeling when those giant ancient wooden doors swing open and we step over the sill. A feeling of awe and being deeply honored to enter. There have been several issues I have wanted to blog about recently, however I have been prevented from doing so due to pressing personal issues. So in passing, a quick video I wanted to share. It is ~5 mins and a delightful listen delivered by Professor Emeritus Dr. Salim Al-Hassani, associated with the multi-award winning global exhibition, 1001 inventions:Muslim heritage in our world . He uncovers something I’ve been coming across in my studies in Islamic knowledge too – that Muslim women’s contributions to all facets of knowledge in the Islamic world is largely unearthed. For example, there was recently published a manuscript written by a very prominent male Muslim scholar, As-Sulami about a 1000 years ago, where he chronicles 80 famous Muslim women scholars/saints of his day! This manuscript, ‘Dhikr an-Niswa al-Muta’abbidat as-Sufiyyat’ was ‘lost’ for about 900 years until recently discovered in a library in Saudi Arabia and now has been translated into English. You can buy it from Amazon. Prof. Al-Hassani mentions that of about 5 million manuscripts surviving from the Muslim Golden Age, only about 50,000 have been edited so far. Many of these manuscripts are rotting away in libraries in Italy, Spain and in old European cities. (where they went during the Renaissance). 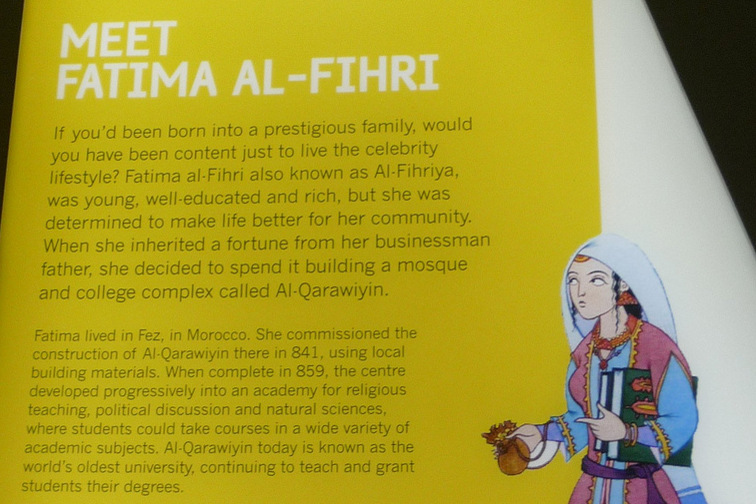 He speaks of Fatima Al -Fihri, who founded the world’s longest running (still functioning) University. I did not know that she is reported to have fasted throughout the time of the building of this University. [Aside – her sister built a mosque in the same city at about the same time. Fatima chose instead to build a University. The Arabic word for University is ‘jami’at’ – the female form of the word for gathering!]. Indeed blessing of God upon her, for her work seems to have been accepted by God as evidenced by its longevity. In Muslim spirituality we consider something lasting as a mark of God’s being pleased with that service. While many good deeds if not rendered upon a sincere intention (that is the intention of it being purely for the worship of God, and not to ‘display one’s piety’ or please society or for fame etc.) are often short-lived. I find this a fascinating standard – as truly one will never know in one’s life-time how good one’s actions have been found… but posterity will! It’s time to get serious – as I’ve often said, there are 1.5 billion Muslims in the world…roughly half are not really participating. We have a lot of work to do. Let’s say bismillah and begin!